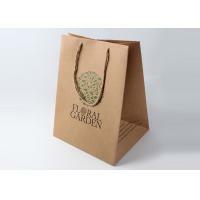 As one of the Chinese top-notch Printing&Packaging manufacturer with more than ten years experience, we produce various of machine made paper bags– natural kraft paper bag, white kraft paper bag, c1s art paper bag, c2s art paper bag, paper box, etc for our customers almost all over the world. 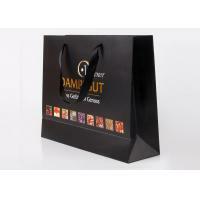 We help our customers to improve their sales, create a lot more extra value, enhance the brand recognition and expand market share by supplying our clients with affordable but terrific quality packaging bags. 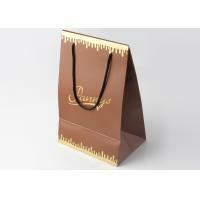 Offer fantastic quality OEM kraft paper shopping bags printing services for worldwide customers. How we enable your success ? 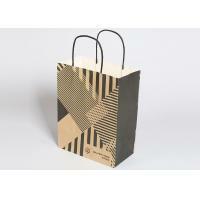 This kraft shopping bag is made of 200gsm recycled kraft paper, Comes with hemp rope handle and eyelet punch. 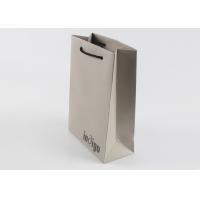 This paper bag is wildly used for gift packing. 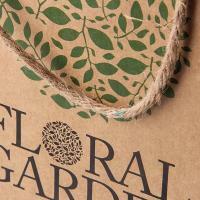 This kraft paper shopping bag comes with hemp rope handles. Other handles also are available , such as ribbon , cotton rope, cotton tape , nylon handle, die-cut handle, PP handle, flat paper handle, twisted paper handles, etc..
We offer EXW, FOB and CIF payment terms. 1. We accept many of payment methods, including T/T, Western Union, PayPal, MoneyGram, etc..
2. Normally, 30% deposit is required for the mass production starting, 70% balance before shipment. This kind of kraft paper packing bag can be used for shopping, electronics, apparel, appliances, household, beauty, cosmetic, health, pharma / nutraceutical, personal care, consumer products, gift, software, food, bakery, beverage, wine, soap, automotive, etc.. Handles Ribbon, PP rope, cotton rope, cotton tape, twist paper, flat paper, die-cut handle, nylon rope , grosgrain, hemp rope. Q1: Do you have bags in stock for sale? 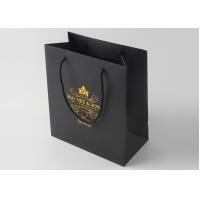 Most of our bags are designed and made as per customers' demand. 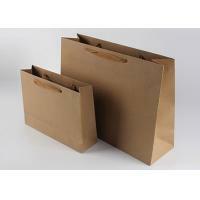 But still have some common sizes blank bags in stock. Yes, we have our own factory and have been in providing professional solutions in printing and packaging industrial over 12 years since 2005. Normally our MOQ is 500pcs. 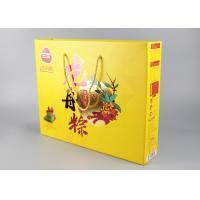 We also produce orders for less than 500 pcs on accasions, which is based on customer's budget. Q4: Can I get a sample for evaluation? Once the order is confirmed, samples can be required for evaluation. Free for a blank sample,you need to pay shipping charge ONLY. Digital sample, charge or not is negotiable. Q5: What kind of information should I offer if I want to get a quotation? Q6: What kind of artwork format is acceptable for printing? Q7: How long it will take to make samples? Blank sample will take 1-2 working days after the artwork file confirmed. Digital sample takes 3-5 working days. Printing sample takes 5-7 working days. Q8: How do you ensure quality of your packaging boxes and printings? There are 14 quality inspection processes: paper quality inspection; attachment quality inspection; printing quality inspection; lamination quality inspection; UV quality inspection;hot stamping quality inspection; embossing(debossing) quality inspection; beer quality inspection; window patching quality inspection; box pasting quality inspection; hand work quality inspection; finished products quality inspection; finished products packaging quality inspection; packing bag loading quality inspection. Q9: How do you transport the products? 3) Express: DHL,FEDEX,UPS, TNT, etc. Send us an inquiry right away by click here.